The Independent reports that the University of California, Berkeley, will release the first volume of Mark Twain's autobiography -- much of it previously unpublished. Clearly, Mark Twain could have said hundreds of unpleasant things in print about his contemporaries while he was alive, but he decided against it. Whether for the benefit of his children, or because he feared reproach (and libel lawsuits) of those he might wound, in 1909 he agreed to his publisher's plan to put his autobiography under seal for 100 years. In addition to delaying publication, he and his publisher agreed to an ingenious marketing plan to promote the book from beyond the grave. Authors sell books. So, publishers are often stymied by the untimely (pre-publication) demise of an author. As a rule, shades of dead authors don’t do much to hand-sell their books. Not so with Mark Twain. According Eugene Exman's The House of Harper, Twain’s inability to promote his forthcoming autobiography may have been greatly exaggerated. In Exman’s book, he reports that one-hundred copies of Twain's memoirs were to be signed by Twain before his death. In the year 2010 they were to be redeemed by the original purchasers' heirs for an additional payment of $50.00. As an aside, if the heirs of the original purchasers are anything like you and I, this brilliant marketing plan will likely be foiled due to lost claim checks. While Twain did not want to inflict unnecessary wounds on those he wrote about, he clearly wanted to deal out justice from the other side – and make certain his memoir had maximum impact when it was published. One has to wonder if the one-hundred signed copies was a turn-of-the-century fabricated trade news story, or whether a Mark Twain time capsule with a trove of signed first editions resides somewhere in the Harper archives. Was Twain’s Publishing Contract the First to Include an Electronic Rights Clause? 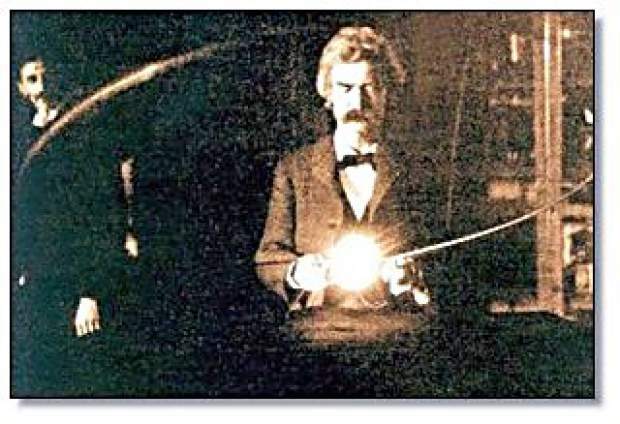 Twain was a gadgeteer. He was an early adopter of new technology. According to his unpublishedautobiography, he claimed that he was the first person in the world to use a typewriter for writing literature. Attaining a modest competency of twelve words per minute, he abandoned the typewriter in the late 1870s because he found it was "degrading his character." Having been in several legal scrapes, Twain valued the advice of his publishing attorney, whose fingerprints are all over his forward-looking 1909 Harper Bros. agreement. Informed most likely by his dual interests in the law and novelties, Twain's publishing agreement is distinguished by what may be the first "electronic rights" or "future technology" clause to appear in a publishing contract. Under the 1909 handwritten agreement, his publisher received rights to publish his memoir “in whatever modes should then be prevalent, that is by printing as at present or by use of phonographic cylinders, or by electrical methods, or by any other method which may be in use.” [Emphasis added]. To paraphrase Twain, his autobiography is likely the last ship to leave his literary shipyard. Unlike many authors, the delay was "not purposeless, but intentional" -- right down to the the turn-of-the-century Wild Wild West-like (as in James West and Artemas Gordon) "future technology" clause. Very clever! But not at all surprised. I did, however, always thought it was you who came up with the future technology clause. Does his publishing contract carry any weight? Since Twain died in 1910, the unpublished portions of his autobiography should be in the public domain, free for anyone to publish, in any form. re: anonymous: I'm not sure. It seems like just about anything that he wrote would have become public domain by now. The 100-year delay is just his will being executed, no? Twain's unpublished manuscripts remained in copyright until, at least, December 31, 2002. 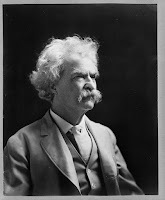 However, to the extent Twain’s literary trustees published any of his memoirs before 2003, under a special provision of the Copyright Act, those copyrights remain in effect until December 31, 2047. Interestingly, Twain was a vocal advocate of perpetual copyright. When he died in 1910, his unpublished memoirs enjoyed perpetual copyright under the old (1909)Copyright Act. So, from a copyright perspective, he must have been as happy as a clam when he passed, but a morose mollusk when the Copyright Act was amended n 1976. In short, the new (1976)Copyright Act put an end to Twain’s post-mortem ability to absolutely control the release of his memoirs. Under the 1976 Act, unpublished works created before 1978 were protected, at least, until December 31, 2002, and until 2047, if published on or before December 31, 2002. So, Harper, arguably, would control exclusive publication rights to those writings through 2047. I applaud the beneficent contribution to American literary history of Mr Samuel L. Clemens and welcome his wit and candor in holding the mirror at just the right angle and correct height to illuminate the American myth and mystique without debunking it. Twain, perhaps the most acerbic pundit and author of the 19th century has managed to extend his validity into the 21st century, not so much by prohibiting the publication of his Autobiography for one hundred years, but by remaining relevant and germane to the way of life in America. Visit http://www.twaindomain.com for more on the publication of the Mark Twain Autobiography.